As a real estate professional who handles probate sales, I have seen first hand the difficult situation and lengthy process families have endured because they were not prepared with an estate plan. Simply stated, estate planning helps protect your family in the event that something bad happens to you. And yet, 55% of Americans do not have a last will, leaving them vulnerable to costly court fees and legal battles. Estate planning is one of the most important steps any person can take to make sure that their final property and health care wishes are honored, and that loved ones are provided for in their absence. A comprehensive estate plan can resolve a number of legal questions that arise whenever anyone dies: What is the state of their financial affairs? What real and personal property do they own? Who gets what? Does a personal guardian need to be appointed to care for minor children? How much tax will need to be paid in order to transfer property ownership? What funeral arrangements are appropriate? Last Will and Testament: A legal document by which a person expresses their wishes as to how their property is to be distributed at death, and names one or more persons, the executor, to manage the estate until its final distribution. Durable Power of Attorney: A legal document that gives another person full or limited legal authority to sign your name on your behalf in your absence. Valid through incapacity. Ends at death. Health Care Surrogate: A legal document that lets you give someone else the authority to make health care decisions for you in the event you are unable to make them for yourself. Living Will Declaration: A written document that details your desires regarding your medical treatment in circumstances in which you are no longer able to express informed consent, especially an advance directive. Designation of Preneed Guardian: A legal document that states if you should you ever become incompetent so that a court needs to appoint a legal guardian for you, you wish for the court to appoint the persons you have designated. 1. Be aware. Speak regularly with your attorney about how to protect your digital assets. 2. 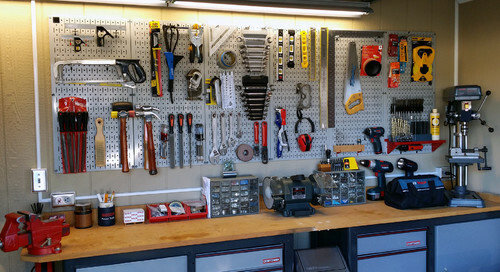 Take a digital inventory. At least once a year, make a list of all your online accounts and subscriptions. 3. Gather your passwords. Make a list of your current passwords and keep it in a safe place. Make sure your trustee knows where to find the list. 4. Be specific. It's essential that your durable power of attorney include specific provisions authorizing someone you trust to deal with your digital online accounts. Your will or revocable trust should have similar provisions to allow your loved ones to deal with those assets after your death. Even though it'd predicated on incapacitation or death, estate planning doesn't have to be morbid. In fact, it can actually be life-affirming, because the process will allow you to take a closer look at the people you care about in life and ensure their future happiness. 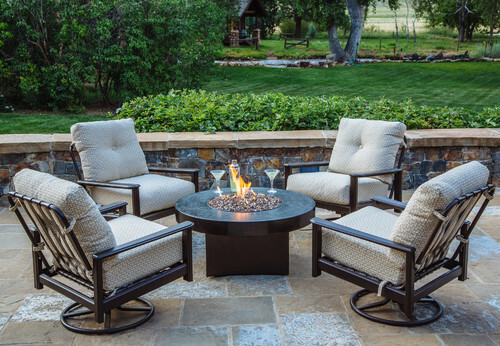 To make this undertaking a little easier, we asked sellers for their very best home-staging advice, and then compiled their greatest tips. If you're getting ready to put your house on the market, use these pointers to spruce things up in a jiffy—and help buyers fall in love with your home. "The best home-staging wisdom I've heard is that potential buyers need to see themselves in your home. That’s why real estate agents tell you to clear out any personal pictures you have on the walls. You don’t want buyers to think of it as your house, because it’ll make it harder for them to picture themselves living there. For that same reason, try your best not to be home when your house is being toured. If buyers see you, they’ll remember that they're guests. You may be wondering if there are tax deductions when selling a home. And the answer is: You bet! But there's also a new tax code—aka the Tax Cuts and Jobs Act—causing quite a bit of confusion this filing season. 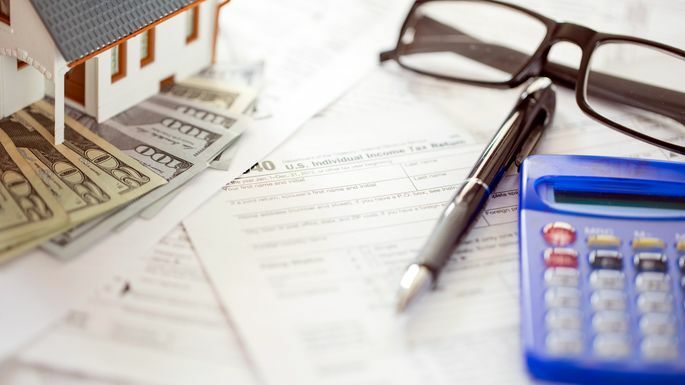 Rest assured that if you sold your home last year (or are planning to in the future), the tax deductions may amount to sizable savings when you file with the IRS. You'll want to know all the tax deductions (as well as tax exemptions or other write-offs) at your disposal. So here's a rundown. Good news! These deductions are still allowed under the new tax law as long as they are directly tied to the sale of the home and a married couple—or a single taxpayer—lived in the home for at least two out of the five years preceding the sale. Another caveat: The home must be a principal residence and not an investment property. Just remember that you can’t deduct these costs in the same way as, say, mortgage interest. Instead, you subtract them from the sales price of your home, which in turn positively affects your capital gains tax. Score again. The new tax law left this deduction as well. 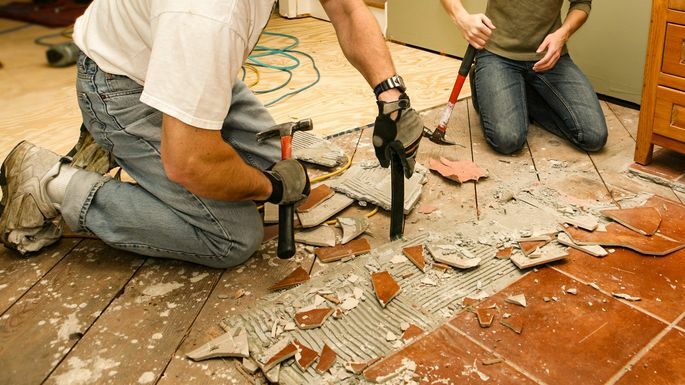 If you renovated a few rooms to make your home more marketable (and so you can fetch a higher sales price), now you can deduct those upgrade costs as well. 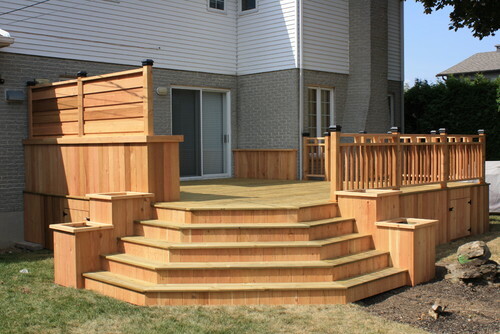 This includes painting the house or repairing the roof or water heater. This deduction is still allowed, but your total deductions are capped at $10,000, Zimmelman says. If you were dutifully paying your property taxes up to the point when you sold your home, you can deduct the amount you paid in property taxes this year up to $10,000. As with property taxes, you can deduct the interest on your mortgage for the portion of the year you owned your home. However, the rules have changed slightly from last year. Just remember that under the new tax code, new homeowners (and home sellers) can deduct the interest on up to only $750,000 of mortgage debt, though homeowners who got their mortgage before Dec. 15, 2017, can continue deducting up to the original amount up to $1 million, according to Zimmelman. Note that the mortgage interest and property taxes are itemized deductions. This means that for it to work in your favor, all of your itemized deductions need to be greater than the new standard deduction, which the Tax Cuts and Jobs Act nearly doubled to $12,200 for individuals, $18,350 for heads of household, and $24,400 for married couples filing jointly (for comparison, it used to be $12,700 for married couples filing jointly). 5. But what's up with capital gains tax for sellers? Lawmakers tried to change the capital gains rule, but it managed to survive—so it’s still one home sellers can use. It isn't technically a deduction (it's an exclusion), but you’re still going to like it. As a reminder, capital gains are your profits from selling your home—whatever cash is left after paying off your expenses, plus any outstanding mortgage debt. And yes, these profits are taxed as income. But here's the good news: You can exclude up to $250,000 of the capital gains from the sale if you’re single, and $500,000 if married. The only big catch is you must have lived in your home at least two of the past five years. However, look for the rules of this exemption to possibly change in a future tax bill. Ralph DiBugnara, president of Home Qualified and vice president at Residential Home Funding, says lawmakers might push to change this so that homeowners would have to live in the property for five of the past eight years, instead of two out of five. But when your house hits the market, dozens of strangers will suddenly be tramping through your bathrooms—and everything that once felt so private will now become painfully public. And those strangers will be passing judgment on what they see. True, the nose hair trimmer you accidentally left on the counter or pile of sweaty running socks forgotten behind the door might not be a deal breaker to a potential home buyer. But they certainly won't be forgotten. Why chance it in the first place? We talked with the experts to lift the lid on the weirdest things buyers found in the bathroom during a home showing—some of which actually killed the sale. When Elizabeth Williamsberg, a real estate and brand photographer in Boulder, CO, went into a quiet, suburban home to take photos, she didn’t register anything out of the ordinary. Until she entered the half-bath. “On the wall above the toilet was a 10-by-13 framed photo of a naked child peeing in an in-ground pool that we immediately recognized as the pool in their backyard,” Williamsberg recalls. “I ran out of the bathroom, and the real estate agent followed right behind me." They called the homeowners to come over and immediately remove the photograph. Even weirder was the reason the photo was there. Heads up: Your bathroom shouldn’t be an experimental art gallery. Remember: You want guests to imagine themselves living in your home, not picturing what went on before you got there. Justin M. Riordan, founder of Portland, OR–based Spade and Archer Design Agency, isn’t a fan of word art—and that opinion was only reinforced when he recently walked into a bathroom of a client’s home. Over the toilet was a poorly placed sign that read "DREAM BIG." “They hung it in a bathroom and then proceeded to leave the toilet lid up. The story it tells the viewer is not too far off from a very effective Metamucil ad,” Riordan says. Heads up: If you love word signage, no one's stopping you from putting it up throughout your house. But steer clear of the bathroom, where pretty much anything can turn into a poop joke. When Susanna Haynie, broker-owner of Co-Re Group in Colorado Springs, CO, took young, first-time home buyers to see a historic home, she expected some old-timey quirkiness. What she wasn't prepared for was the small fridge placed within reaching distance of the toilet. "The combination of the two, next to each other, got my buyers rolling,” Haynie says. The mysterious toilet fridge apparently wasn't a deal breaker—the couple ended up buying the house. “But when my clients moved in, the fridge was removed,” Haynie says. Heads up: Food storage only in the kitchen, please. And if there's anything else in your bathroom that belongs in your kitchen, be it a microwave or your collection of spatulas, please put them back. After listing a hoarder's house, Candy Miles-Crocker, an associate broker for Long and Foster Real Estate in Washington, DC, poked her head into the crowded bathroom—and saw an enormous mound of cigarette butts in the sink. “Why the owner did this, I never asked,” Miles-Crocker says. Even worse, the seller wouldn’t allow her to clean them up—or move anything—to prep the home for a showing. Instead, he created a path through the home’s crowded contents from the front door to the kitchen and bathroom. Heads up: If your house is in serious disarray, consider "extreme cleaning" professionals to help get your home show-ready. One of the weirdest bathroom encounters Lauren Cangiano, a licensed associate broker for Halstead Manhattan in New York, ever had was with a trendy, high-end Toto programmable toilet. Heads up: If a fancy toilet floats your boat, hey, more power to ya. But if you've got a bunch of bells and whistles, try to figure out how to deactivate them before you show your home. Marie Bromberg, a licensed real estate salesperson for Corcoran in New York, had a harrowing bathroom moment at her very first listing. At one point, an elderly lady stepped into the bathroom and shut the door. “She didn't even ask! She just went in to do her business,” Bromberg says. She was in there a long time, and once she exited, Bromberg realized there were two problems. First: “The smell was awful, and now everyone at the open house could smell it because it's a studio," Bromberg says. Before other visitors could complain, Bromberg hastily opened a window and turned on the exhaust fan. Then, she found some paper towels, closed the door, and cleaned the toilet. Heads up: While the blame for this one can't possibly fall on the seller, there are some things you can do to prevent poop-related problems that might arise during a showing: “Never have toilet paper at an open house, so as to discourage people from doing the deed,” Bromberg says. But are you growing weary of playing it safe? Eager to put your decor in the blender and mix it up? Luckily, 2019 is delivering for change agents. This year, we're tossing neutral design schemes out the window and embracing our collective desire to make a statement. We've identified the leading kitchen design trends—all you need to do is let them marinate. Think bold colors, bigger backsplashes, and new looks for a space that's always on display. 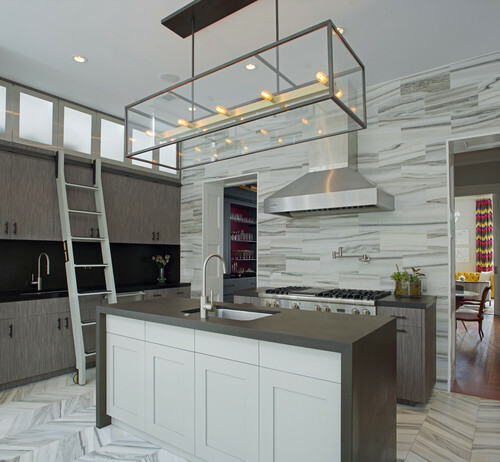 Here’s a look at what to expect this year in kitchen design. 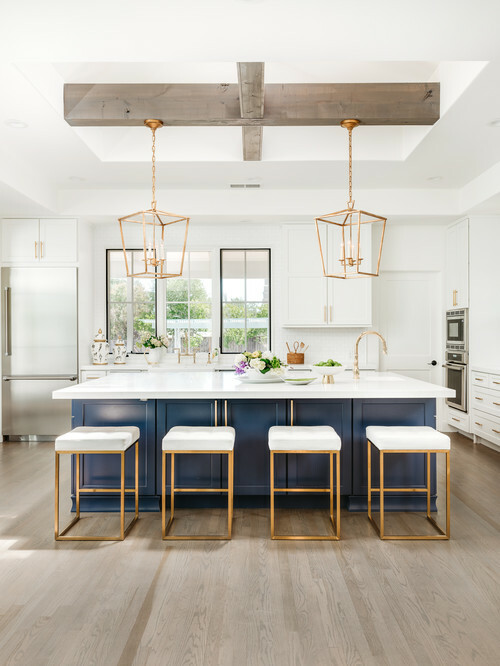 “Get ready to see kitchen trends take a turn this year from light and airy to dark and moody,” says Leslie Bowman, interior designer and founder of The Design Bar in Chicago. “While white will certainly still find its way into designs through glistening subway tiles and countertops, the white-on-white aesthetic has seen its day." 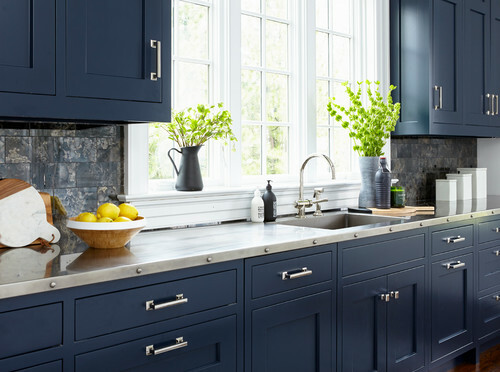 In particular, expect to see darker saturated hues, such as blues and greens, trending in kitchens this year, says Annabel Joy, interior designer and founder of Trim Design Co. in Boston. "We think Rosemary green will be the MVP of 2019," she says. "It’s the perfect marriage of muted sage with deep forest, and it looks great with the current matte-black hardware trend as well as with perma-popular brass." Apologies to those with "Fixer Upper" fatigue: The modern farmhouse look made famous by Joanna Gaines isn't going anywhere anytime soon. But if you're looking for a new twist, you're in luck, Bowman says. In 2019, farmhouse will continue evolving, evoking less of a country chic vibe and coming in hard with cleaned-up contemporary finish. 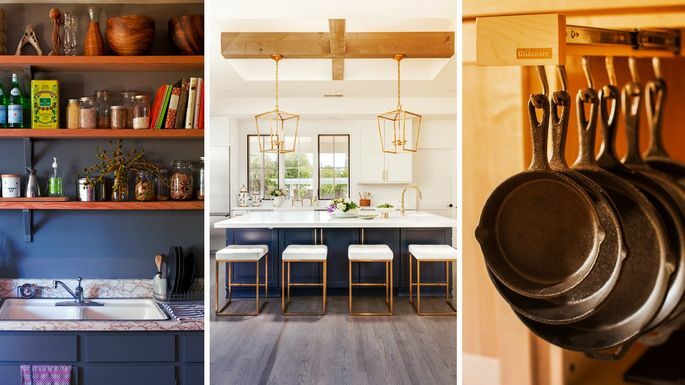 “You can expect to see the farmhouse aesthetic become a bit more refined and transitional with a heavier lean toward bolder, elegant kitchen designs,” she says. “Think of it like this: Farmhouse went to rehab and took a nice, long nap,” adds Justin Riordan, founder of Portland, OR–based Spade and Archer Design Agency. “There’s noting shabby or rustic about it. It’s a refined, more masculine version of farmhouse.” That’ll mean no knots in the wood and plenty of pristine lines, he says. Think: gold hardware, elegant light fixtures, and use of colors instead of an all-white design. 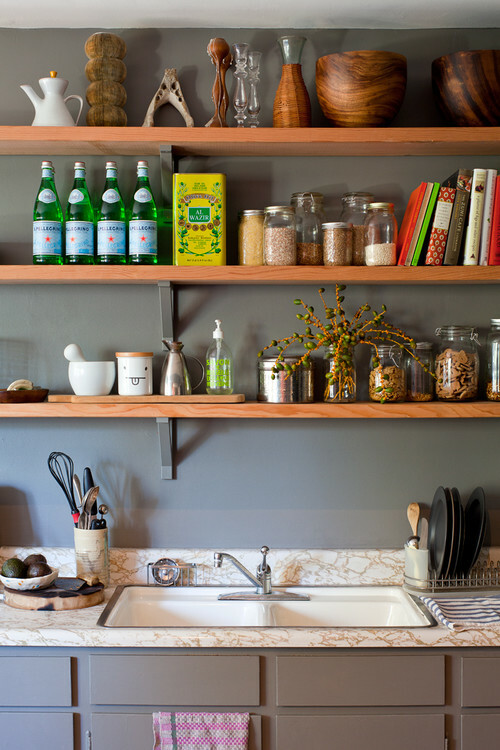 The debate over open shelving has raged on for several years now. While some of us prefer to hide our kitchen gadgets and gizmos behind opaque cabinetry, others of us live to show off our Instagram-worthy counters and shelves, says Jacqueline Gonzalez Touzet, architect and designer at Touzet Studio in Miami. And because of those people, open shelving will continue to have a foothold in our kitchens in 2019; but this year, we're taking things a step further. It's not just cookware and Smeg appliances we're showing off on our floating shelves. "People like to express their individuality and curate their collections in their upper cabinets and shelving," Touzet says. "They don’t want cookie cutter, and the open shelving blurs the line between kitchen and living space. 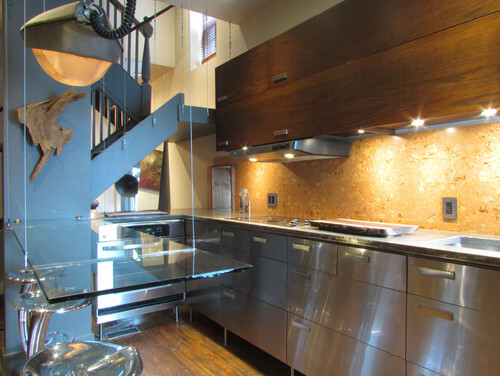 We have clients that showcase collections or display books or art in their kitchens." "For years now we have had the same [rectangular] tile backsplash used as the color accent in the kitchen," Riordan says. "Thank goodness it's finally falling out of style." In its place, we're seeing bigger, bolder patterns that sometimes remove the need for backsplash entirely. "More and more walls are being completely covered with either tile, or a solid surface like quartz from the floor to the ceiling—and we love it," Riordan says. "We could not be happier with the clean, finished look." Any design-oriented homeowner knows that kitchen cookware is as much of a decor choice as the backsplash or cabinetry that surrounds it. And in 2019, our utensils, pots, and pans are changing, too. "We're seeing cookware shy away from chemical-laden Teflon and nonstick, and heading directly for traditional, good, old-fashioned cast iron," Riordan says. 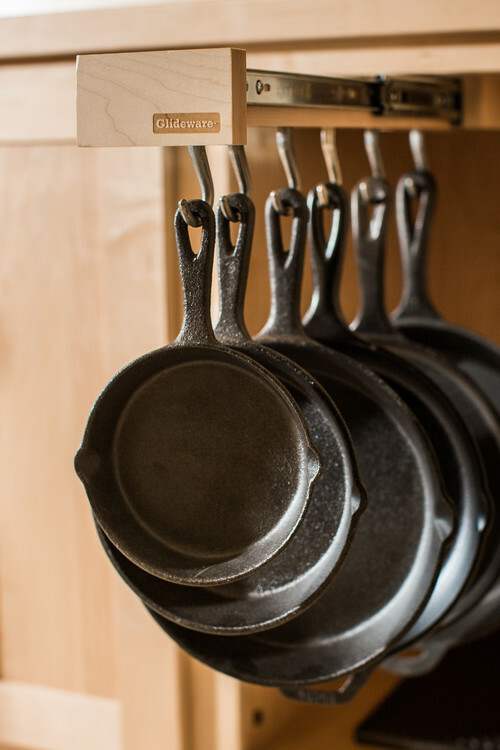 "It takes some getting used to, as the pans are never washed with soap, but man oh man there are some beautiful American-made, cast-iron cookware out there." Hang these prominently in your kitchen to make a statement about the culinary expert you are. While wood floors and granite countertops aren't going out of style anytime soon, we're beginning to look for ways to infuse our kitchens with more eco-friendly design features. Examples: bamboo flooring, countertops made out of recycled materials, or even the leftovers from wine night. "Sustainable materials like cork are being used in unexpected ways like flooring and even backsplash," says Trim Design's Joy. If you love the environment but are nervous about making such a big change, start small: Add recycling stations to your kitchen, or swap out your window dressings and chair cushions for natural fabrics. Just because you and the sellers have agreed on a price doesn't mean it's a done deal—your lender needs to be on board, too. After all, it's the lender's real estate investment as well. To get a mortgage, you'll need a home appraisal because the home serves as collateral for your lender. If for some reason you end up unable to make your mortgage payments, the lender will have to foreclose on your home, then sell the property to recoup its costs. So your mortgage lender will have to know the value of your home before handing over that large chunk of change. While the home appraisal process is somewhat similar to getting comps—as you did to determine a fair price—the appraiser delves in deeper to determine the home's exact value. An appraiser will investigate the condition, the square footage, location, and any additions or renovations. From there, he or she will appraise the home and determine its value. An appraiser is trained to be unbiased, says Adam Wiener, founder of Aladdin Appraisal in Auburndale, MA. “I don't care what anybody wants the home to be worth," he says. “As an appraiser, I'll give you the answer. You may not like it, but it's the answer." Usually, the lender or financing organization will hire the appraiser. Because it's in the best interest of the lender to get a good home appraisal, the lender will have a list of reputable pros to appraise the home. Whoever takes out the mortgage pays for the home appraisal, unless the contract specifies otherwise. Then the buyer pays the fee in the closing costs. If a seller is motivated, he may pay for the home appraisal himself to back his asking price, which benefits the buyer by reducing closing costs. An appraiser sets out to determine if the home is actually worth what you're planning to pay. You might be surprised by how little time that takes; the appraiser could be in and out of a home in 30 minutes, and that's not a reason to panic. An appraiser doesn't have the same job as a home inspector, who examines every little detail. While they'll pay particular attention to problems with the foundation and roof, the home appraisal process includes noting the quality and condition of the appliances, plumbing, flooring, and electrical system. With data in hand, they make their final assessment and give their report to the lender. The mortgage company is then required by law to give a copy of the appraisal to you. As the buyer, you'll be paying for the home appraisal. In most cases, the fee is wrapped into your closing costs and will set you back $300 to $400. However, just because you pay doesn't mean you're the client. “My client is the lender, not the buyer," Wiener says. 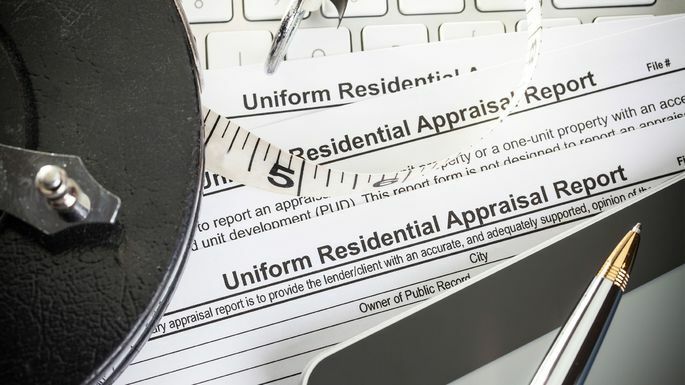 This ensures that appraisers remain ethical—in fact, it's a crime to coerce or put any pressure on an appraiser to hit a certain value. Appraisers must remain independent. “Anything less, and public trust in the appraisal is lost," says Wiener. In essence, the home appraisal process is meant to protect you (and the lender) from a bad purchase. For instance: If the appraisal comes in higher than your asking price, it's generally fine. Sure, the sellers could decide they want more money and would rather put their home back on the market; but in most cases, the deal will go through as expected. If your appraisal comes in lower than what you offered, this is where things get tricky: Your lender won't pony up more money than the appraised price. So if you and the sellers agree on $125,000 but the appraisal comes in at $105,000, it creates a $20,000 shortfall. What's a buyer to do? Read on. If the appraisal process happens, your appraisal comes in low, and your contract with the seller was contingent on an appraisal, you could walk away and have your earnest money returned. Come up with the cash to cover the difference between the appraisal and offer price. Ask the seller to cover the difference. Challenge the appraisal, and pay for a second opinion. Keep in mind, though, that your new report could come out identical. Also keep in mind that if you do choose to walk away, that's actually good news, although it may not seem like it at the time. Why? Because the appraisal kept you from paying too much for your home. Once your appraisal is done, you're still not ready to close without another nerve-racking step called a home inspection. What is the difference between a foreclosure and a short sale? Foreclosures and short sales are both options for homeowners who fall behind on mortgage payments, but it's important to understand the difference between these two processes. So if you're struggling to pay your mortgage and aren't sure what to do, allow this primer on foreclosures vs. short sales to set you straight. Here's what these things are, their pros and cons, plus how to tell whether a short sale or foreclosure is the better option for you. A short sale happens when a homeowner owes more on the mortgage balance than the market value or sale price of the property at the point the owner wants to sell. For a short sale, the homeowner is essentially asking the mortgage lender (typically a bank) to accept a lesser amount than the total mortgage owed. For example, if the homeowner sells the house for $250,000, but the remaining mortgage loan balance is $300,000, the seller is essentially $50,000 "short" on paying the lender back. That's a short sale. For the seller, one thing you'll want to watch out for is a deficiency judgment. A deficiency judgment is where, after a short sale ends, the mortgage holder seeks to recover the "deficiency" (the money it lost in this home sale) through a court order placing a lien on the debtor for further money (so in this case, a mortgage lender acts as a lien holder). Some states outlaw this practice, but you should ask, just so you aren't blindsided by it later. Foreclosure is a legal process that happens when a homeowner (although "borrower" might be a more appropriate term from the perspective of the lender) is unable to make mortgage loan payments for a significant period of time. After three to six months of missed mortgage payments, a lender will issue a Notice of Default with the County Recorder's Office. This notice is to let the borrower know he is at risk of foreclosure—and when they foreclose, the current owner will be evicted. If the debt is not recouped, lenders will step in and foreclose on the property. To foreclose, they'll schedule a foreclosure auction to sell the house to a third party. Foreclosure auctions will be advertised in local newspapers and are typically held at either the property or the local courthouse, says Cathy Baumbusch, a real estate agent with Re/Max Allegiance in Alexandria, VA. If no one buys the home at auction, the lender becomes the owner and it's considered a bank-owned or REO (real estate–owned) property. 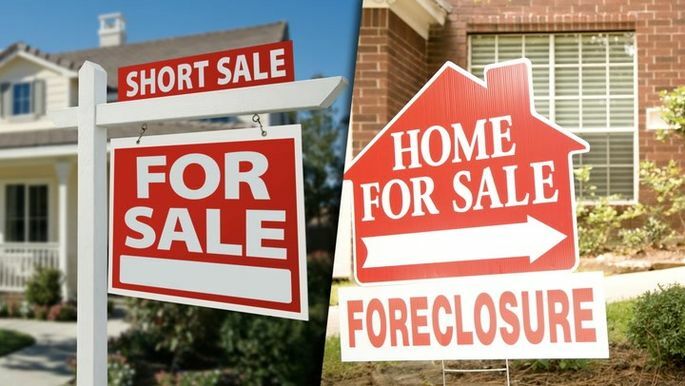 Short sale and foreclosure are similar in that they're both financial options for individuals who own homes but find themselves in financial distress. Both also have a negative impact for your tax return, credit score and credit report, and future prospects getting a loan. But short sales and foreclosures differ greatly in process. A short sale transaction occurs when mortgage lenders allow the borrower to sell the house for less than the amount owed on the mortgage. The foreclosure process occurs when lenders repossess the house, often against an owner's will. Timing also differs: Short sales can take up to one year to close, while foreclosures generally move along much faster because lenders are intent on recovering the money they're owed. Furthermore, a short sale is far less damaging to your credit score than foreclosure. In fact, people who go through the short sale process can usually buy another house without having to wait, although securing a second mortgage might be more challenging. Foreclosure, on the other hand, will stay on your credit report for seven years. You'll also have to wait five years to buy another house. “I wouldn't recommend purchasing a short sale for first-time buyers, who may get frustrated with the extra paperwork and long waits,” says Marlene Waterhouse, owner of Short Sale Solutions. The average short sale takes around 90 to 120 days, and sometimes even longer. Why? Mortgage lenders often won't approve the sale without buyers agreeing to its demands like paying for many additional fees such as repairs, wire transfers, and closing costs. These are all costs the seller would typically be on the hook for, but in a short sale, the bank is stuck with the bill. Therefore, to reduce its costs, the bank may try to negotiate these costs with the buyer.